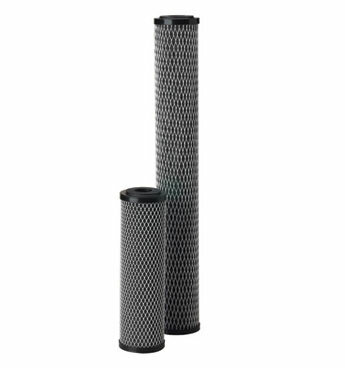 The Carbflex™ Series CAF-250 CFBC Filter Cartridges offer the effective chlorine taste & odor reduction found in traditional carbon block media while providing superior sediment reduction with resistance to premature plugging. Post-filtration layer fused to the carbon/fiber media blend ensures cartridge will not release fines into the effluent stream. [tab:Product Operation]Carbflex™ CAF-250 Cartridges are modified molded blocks manufactured using proprietary Fibredyne™ technology. This technology creates a unique filter media by attaching powdered activated carbon onto a cellulose-free synthetic fiber matrix. Benefits of this technology include low pressure drop over the entire life of the cartridge and up to three times the chlorine taste & odor and dirt-holding capacity of traditional 0.5 micron carbon blocks.